Subaru has revealed a new and innovative driver assist system for handicap drivers on the all-new 2014 Forester. Subaru who is one of the world’s most progressive automakers, and on the move around the globe, has just revealed a world’s-first for handicapped drivers. 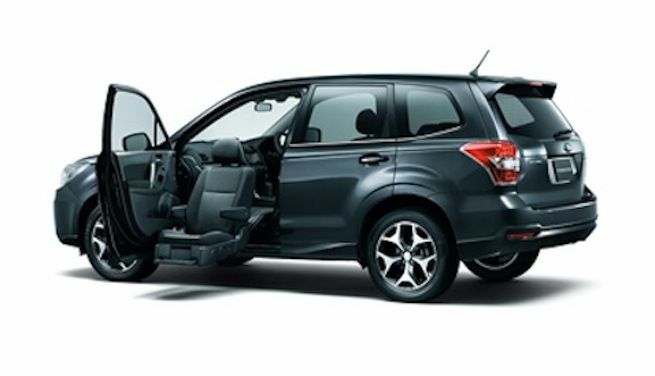 Fuji Heavy Industries Ltd., the maker of Subaru automobiles in Japan revealed a 2014 Forester with the first-ever innovative “Wing Seat” for handicap drivers. Subaru Japan has released an image and brief information on the new innovative driver assist system. We don't have much information on the new assist system, but it will be used for drivers with disabilities who need assistance getting into the seat and behind the wheel. The new Forester will be the first car with such a feature. They will officially unveil the Driver Assistance System from Sept 18-20 at the Tokyo Big Sight exhibit. The 40th HCR 2013 is organized by the National Council of Social Welfare Public Relations Association in Japan. Subaru will display the new Driver Assistance System on the all-new 2014 Forester. They will also display the new 2014 XV Crosstrek Hybrid 2.0iL with EyeSight. The new 2014 Subaru Forester made its world premiere in Tokyo back in November 2012 and has been a huge success around the globe. This new driver assist wing seat could make the Forester even more popular around the world. The need for handicapped accessible vehicles is great. The vehicles are designed to help those with handicaps that keep them from riding in a regular vehicle. Most of the vehicles that are available are after-market minivans and use a side door that lifts the entire wheelchair into the van. These can be very expensive to retrofit and come with price tags that run from $50,000-$80,000 and require a complete customization. The new system from Subaru would allow the driver in the wheelchair to move from the wheelchair to the car seat easily. The new Forester with the new innovative driver assist system could be a big hit with handicap drivers. Subaru did not release pricing on the new Forester Wing Seat or availability. Stay tuned to Torque News for all the latest news from Subaru around the globe.